UrFight & Intimidation Clothing are pleased to announce the sponsorship of Saturday’s Apex Fights 9 MMA & Kickboxing event. Held for the first time in Newport, Tennessee, many local fan favorites will be in action with UrFight and Intimidation products available at the company’s booth. In addition to selling popular styles from the UrFight and Intimidation Clothing brands, UrFight will also be sponsoring amateur fighter Shawn Perkins of Clairfield. Specific UrFight styles will be available at the company’s booth with personalization available on many of those shirts, hats, shorts and more. Details on the event can be found on the event’s Facebook page. UrFight and Intimidation Clothing are proud to announce the sponsorship of RFA headliner Adam “Primetime” Townsend live on AXSTV. Townsend (14-3, @AdamTownsendMMA) will square off with Ernest Chavez (9-2) on Friday night in the main event at RFA 33 in Costa Mesa, California. The RFA MMA event will be televised on AXS TV with the main card beginning at 10 pm ET. The first fighter ever sponsored by UrFight, Adam “Primetime” Townsend is a member of the D-Evil Fight Team in Johnson City, Tennessee. At 14-3, Townsend has won 8 straight and has finished his opponent 10 times in his 14 wins. This will be his 4th fight of 2015 after a very busy 2014 which saw Townsend step into the cage six times. Intimidation Clothing, LLC and UrFight are pleased to announce that the two companies have agreed to terms to team up in a never before seen merger. The two brands, which both cater to the MMA/Combat Sports Industry, plan to take their individual strengths and combine them in what will surely benefit MMA fighters, gyms and promoters on the local level. After years of competing against each other, a newly-formed collaboration will work to better serve Local MMA and expand the awareness for both brands across the globe. Long known for their personalized MMA fighter shirts, UrFight has proven to be the hardest working brand in the industry. Commonly seen at multiple Local MMA events across the South, Midwest and East Coast, the brand has sponsored several hundred fighters across the USA and plans to continue to expand their sponsorship roster. To kick the partnership off, both UrFight and Intimidation products will be available for sale at the Happy Valley Fight Series event in Elizabethton, Tennessee on Saturday, December 5th. MMA fighters looking to benefit from the merger can apply for sponsorship with UrFight as long as they have a fight lined up in the near future. 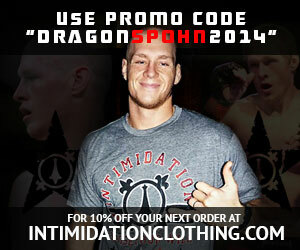 Continued expansion of Intimidation Clothing’s sponsorship program will be announced in the coming months. Intimidation Clothing founder Luke Jernigan is set to join Cage Zombies Radio tonight to talk Local MMA, other MMA-focused apparel brands, fighter sponsorships and more. Hosted by long-time MMA media members Matthew Gaither and Spencer “Pablo Diablo” Kirksey, Cage Zombies Radio is a product of MMA Madhouse Productions. Jernigan is set to join Gaither and Kirksey at approximately 10:10 pm ET. > Fans interested in hearing the program can do so here – Cage Zombies Radio. Intimidation Clothing is pleased to team up with fast-rising, undefeated bantamweight prospect Nathan Maness on the latest addition to Intimidation’s signature shirt program. Maness (5-0 pro), who has fought at weights from 135 to 155lbs, joins a exclusive list of athletes with a signature tee from Intimidation which includes UFC Hall-of-Famer Ken Shamrock, UFC bantamweights Jessica Eye & Jessamyn Duke, Bellator MMA knockout artist Brian Rogers and a variety of UFC veterans and up-and-coming stars. > CLICK HERE to buy the Nathan “Mayhem” Maness signature tee online today! The Nathan Maness signature t-shirt will be a men’s cut regular fit black shirt made from 4.5 oz combed ringspun 100% cotton which has a super soft feel and is lightweight.